Carol's career in Japanese law and language over the past 15 years has focussed on contributing to global access to and comparative insights into Asian law. 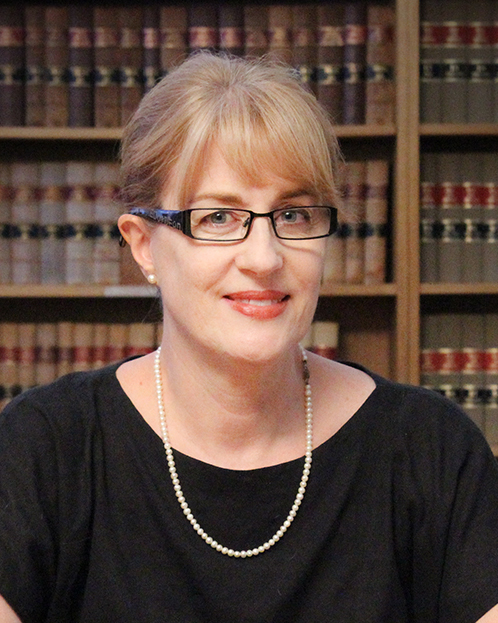 Her teaching work has focussed on equipping an emerging generation of Asian and Australian lawyers with comparative and practical legal skills, while also bringing large-scale Japanese public legal translation projects to fruition. Her doctoral research is a comparative empirical study of the effectiveness of 'soft' civil oversight systems in prisons in Japan and the Australian Capital Territory, in light of European standards for the monitoring of closed environments. The study has implications for how we understand the development, complexity and effectiveness of mechanisms for controlling risk-laden government activity in the Asia-Pacific region. (2016, forthcoming), "Satoshi Tomiyama, Director-General for the Correction Bureau, Japan", in Dilip K. Das, Martha Henderson Hurley and Mark Nolan (eds. ), Trends in Corrections: Interviews with Corrections Leaders Around the World, Vol. 3, CRC Press Taylor and Francis Group, (Boca Raton). (2015), "Reforming Japanese Corrections: Catalysts and Conundrums" in L. Wolff and Ors (eds. ), Who Rules Japan? Popular Participation in Japan's Legal Process, Edward Elgar (Cheltenham and Northampton, MA), pp. 128-163, (available as an individual chapter at www.elgaronline.com). (2015), "Does Imprisonment Work? ", Legaldate: Criminal Law, Vol. 27, No. 2, pp. 9-11. (2014), わかりやすい語法による英文就業規則の作り方 Drafting Work Rules in Plain Legal English, with Tetsuro Kurata, Nihon Horei, (Tokyo), 264 pp, (available at www.amazon.co.jp). (2007), "Found in Translation: The 'Transparency of Japanese Law' Project in Context", Journal of Japanese Law, Vol. 12, No. 24, pp. 187-199, (available at https://sydney.edu.au/law/anjel/content/anjel_research_pap.html). (2006), "Japan's New Privacy Law in Context", University of New South Wales Law Journal, Vol. 29, No. 2, pp. 88-113, (available at www.unswlawjournal.unsw.edu.au/issue/volume-29-no-2). Carol's career in Japanese law and language over the past 15 years has focussed on teaching in the Asian and comparative law context to equip an emerging generation of South East and Central Asian lawyers, and bringing large-scale public legal translation projects to fruition to open the world of Japanese law to the international community. Her doctoral research capitalises on the analytical, negotiating and linguistic skills developed in her earlier career to conduct ground-breaking comparative empirical research into the effectiveness of a function essential to the rule of law in all modern democracies - the civil oversight of risk-laden government activity. Specifically, her study compares a civil oversight mechanism developed in an East Asian context with a similar mechanism developed in Australia, against the backdrop of European standards for the civil oversight of closed environments. The study aims to shed light on both complexity and diversity in the manner in which democratic governments in the Asia-Pacific region are held accountable through civil oversight. (2016-2018), Collaborator in Australian aspects of Japanese joint research project also covering New Zealand, Australia and California, 高齢犯罪者の自己像の認識と、これらの再社会科への挑戦に関する実証的研究、[Elderly Prisoners' Self-Recognition and the Challenge of Reintegration into Society], with Yoko Hosoi (Toyo University, Japan), John Pratt (Victoria University, NZ), Takeshi Koyanagi (Tokiwa University, Japan), Kaoru Watanabe (Toyo University, Japan). (2106, forthcoming), "A 'Genuine Profession' of Legal Translators for Japan: Broader Horizons at Last", Language and Law: The Journal of the Japan Association for Language and Law 法と言語, No. 3. (2002) “‘Perceptions of the Current State of the Japanese Legal System’: Interview with Koji Sato, Chairman of Japan’s Judicial Reform Council”, with Simon Thornley, Australian Journal of Asian Law, Vol. 4, No. 1, pp. 76-91. Sep 2016, "Defining and Advancing Civil Oversight in Japan - the Case of Japanese Prisons" Inaugural Asian Law and Society Association Conference, Singapore. Mar 2016, "Re-shaping the Japanese Penal Landscape - is Soft Civil Oversight Enough? ", The Howard League for Penal Reform Justice and Penal Reform Conference: Re-shaping the Penal Landscape, Oxford. Dec 2015, "Civil Oversight: One Size Fits All? Insights from Prison Visitors in Japan and the ACT", Law and Society Australia and New Zealand Inside Out Conference, Adelaide. Aug 2014, “Prospects for a ‘Genuine Profession’ of Legal Translators: Paving the Way for the Global Sharing of Japanese Legal Ideas”, 14th International European Association of Japanese Studies Conference, Ljubljana. May 2014, “Reforming Japanese Corrections: Catalysts and Conundrums”, 50th Law and Society Annual Meeting, Minneapolis. Oct 2011, “Translating Employment Rules 101”, JATLAW Workshop, Japan Association of Translators, Tokyo. 2011-2015 Member, Japanese Examiner Panel, National Association for the Accreditation of Translators and Interpreter (NAATI). 2010-2016 Chair, JATLAW Steering Committee, Japan Association of Translators. Carol's doctoral research has relevance for the design and implementation of civil oversight or monitoring systems for not only prisons, but other 'closed environments', including juvenile and immigration detention facilities and aged and disability care facilities. Her comparative study involves civil prison oversight regimes in both common law and civil law jurisdictions. These regimes range from the relatively intrusive models found in the UK to the softer, more collaborative models found in Japan and the ACT. Her work aims to elucidate those civil oversight features more likely to maximise the benefits for both prison inmates and correctional staff, and contribute to robust citizen participation in the rule of law, particularly in the East Asian context.